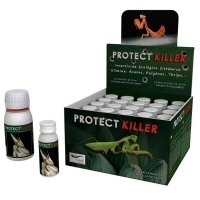 Agrobacterias Protect Killer is a universal insetticide. Conteins Neem Extract 80%, citrus Extracts 20%. Protect Killer fitofortificante acts as an insecticide and given its nutritional properties and activators of specific enzymes in plant metabolism. It is rich in carbon, oxygen, hydrogen, terpenoids, steroids, alkaloids, flavonoids, glycosides, among others. FOLIAR APPLICATION: 1ML/L, repeat a week to reinforse the effect.